In the summer of 2013 an idea formed. 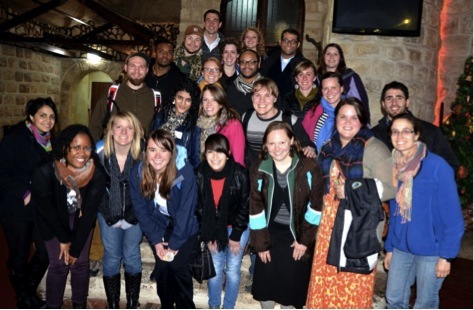 What would it look like to train young adults to lead other young adults on trips to the Holy Land? This idea became a reality when sixteen young adults from various synods and regions traveled to Israel and Palestine in January of 2014. This project we made possible through a collaboration with ELCA Young Adult Ministry and the ELCA’s Peace Not Walls Campaign. Build a base of individuals who not only travel but return home to engage their local contexts in issues of peace and justice. In 2005, the ELCA Church Council adopted a Churchwide Strategy for Engagement in Israel and Palestine. The strategy is now in its eighth year of implementation through the Peace Not Walls Campaign. This campaign lives out its purpose through practicing accompaniment, building awareness and inviting individuals and congregations to engage in advocacy. The goal of this project is to aid in meeting the eight highlighted tasks of the strategy by inviting young adults to connect to this church’s efforts by providing a space where justice and faith collide for the purpose of forming faith and developing leaders. Young adults are often said to be missing from our communal life of faith. This means that people don’t see them in traditional spaces. However, young adults throughout our society are actively engaged in issues of peace and justice and the ELCA has numerous opportunities, strategies and campaigns that speak to this reality. However, the one thing that make us different from other social justice organizations is our faith – our believe in a Triune God who became incarnate in the person of Jesus. This project is not about just enlightening young adults to social, political, historical and cultural realties. This project is not about just about engaging young adults in advocacy efforts. This project is not just about building relationships. This project is about deepening faith and connecting ones beliefs to ones actions in the world. This year, a total of 8 trips have been planned with one already having gone and returned (LaCrosse Area Synod). The initial model was for trips to be synodically or regionally based, but now, the remaining 7 trips are open to young adults across the country. On this site you will find descriptions of each trip, dates, information about leaders and the goals of each experience. These trips are designed for people who have graduated high school and are between the ages of 18 and 30. Please share the word far and wide. The deadline to sign up is February 28, 2015. Check out each of the trips. See which one works best for you. Read over the specific trip goals. Contact the trip leaders for more information and to sign up. That’s it! Contact Us if you have any questions. We hope you consider joining this movement of young adult faith-based justice seekers. This entry was posted in Uncategorized by pnw2014. Bookmark the permalink.